In 2012, Garmin continued its tradition of affordable smart watch GPS technology by introducing the Forerunner 910XT, an upgraded version of the 310XT model. 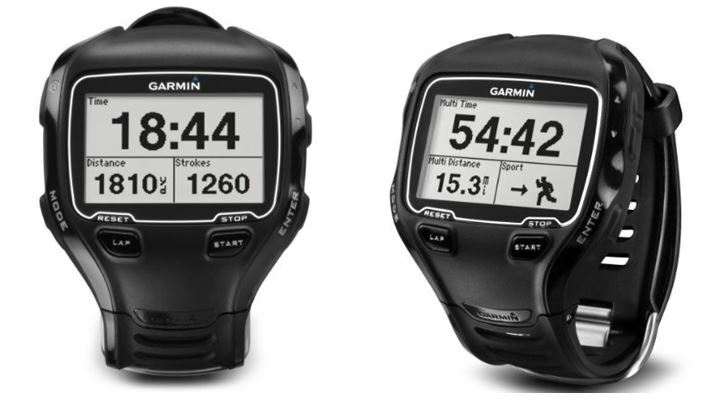 This lightweight multi-sport version of the popular Forerunner series weighs in at 72g, (2.5 ounces) and features a large customizable display screen of 1.3 by .8 inches. While this watch, unlike most other Forerunner versions, cannot be used as a sports watch it has many useful features for training and recording run data; more, in fact, than some of Garmin’s later offerings. The versatility of this watch lies in its ability to be used for running, swimming and biking; the triathlon of smart watches. The running, swimming and bicycling modes can be changed easily and quickly without affecting times. The Garmin Forerunner 910XT has up to 20 hours of battery life with its rechargeable lithium-ion battery. It has the capacity to store 1000 lap’s worth of data in the watch history. Like most of Garmin’s Forerunner versions, maps cannot be uploaded in advance; the Forerunner 910XT, however, will allow the user to program favorite locations and recall waypoints. 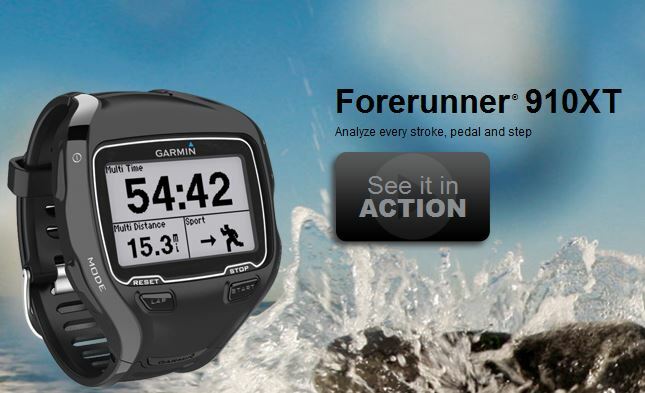 The Forerunner 910XT allows wireless interface with Garmin Connect, Garmin’s online community. At Garmin Connect, users can upload personalized triathlon workouts to the watch, keep track of other user’s records and runs, receive motivational challenges, and share and store personal records directly from the watch itself. Garmin Connect is accessible via mobile phone in a downloadable app or from a computer, to be used with Windows XP and newer operating systems. It is power meter compatible (measures power of bicycle strokes) with Garmin’s trademarked ANT+ feature. ANT+ is the technology that allows the watch to work with other third party apps than just Garmin itself. Wireless Bluetooth technology allows real time data streaming and information sharing. The Garmin Forerunner 910XT leads the way with built in options to suit most smart watch enthusiasts. The Forerunner 910XT provides waterproof protection even while swimming up to 50 meters deep. It offers swim dynamic information such as stroke counts, distance and pool length, lap counting, and can even identify the stroke a swimmer is using. On land, the Garmin Forerunner 910XT offers advanced technology such as the ability to measure time, distance, and pace. With a built in barometric altimeter, the Forerunner 910XT measures elevation and grade as well as climbing and descent information. Motivation comes in many forms, and the Forerunner 910XT ups motivational levels by allowing the user to train or compete against a virtual partner. It also permits course competition to compete against the runner’s past activities. Garmin Connect further ups the motivation by allowing challenges and comparisons to their online community. The Forerunner 910XT boasts several auto features. The first, auto scroll, allows the watch to page through a continuous loop of workout data during the session, allowing the athlete to keep track of information without even touching the watch. The auto lap feature alerts when a predetermined lap is finished and automatically begins a new one. The Forerunner 910XT has an auto pause feature that stops the watch timer during a period of inactivity, and then resumes the workout when the user begins to move again. The Garmin Forerunner 910XT features audible and/or vibratory alarms that can be set to alert when a lap is finished, there is any variation of pace during the workout session, or a specific time or distance has been reached. This smart watch can be paired with a heart monitor for advanced cardiac stats. While the others in the Forerunner series offer more limited heart rate monitoring, the Forerunner 910XT takes it to the next level. It offers caloric consumption computation based on cardiac output and also features aerobic effects on overall fitness. The heart rate can be set and monitored to ensure the runner stays within personal cardiac output zones and alert when the rate falls above or below these predetermined rates. There are three versions of the Garmin Forerunner 910XT to choose from. The first, the watch alone, comes equipped with the watch itself, a USB ANT Stick, AC charging adapters and a charging clip, and an expander strap. This package costs $399.99. The Premium Heart Rate Monitor version comes with all listed above plus the heart rate monitor for $449.99. The last version is called the Triathlon Bundle and is the most comprehensive package Garmin offers on the Forerunner 910XT. It offers all the above mentioned features plus a cadence and speed sensor. It also offers a quick release kit, which allows the user to quickly remove the watch and attach it to a bicycle with the least interruption to the workout. This package is priced at $499.99. Accessories for the Forerunner include carrying cases, various charging cables including a car charger, bicycle mounts, power meters and pods for cycling, different sized bands for the heart monitor, and external battery packs for increased training time in a session. The Garmin 910XT can be a very useful tool for the training triathlete and well worth the price tag considering all of the features it offers. This entry was posted in Garmin GPS Running Watch and tagged Garmin, Garmin Forerunner 910XT. Am I a “running snob” because themed runs don’t appeal to me?